Redjacks are militarized frames used by Lord Shaxx to secure potential Crucible sites and Sparrow Racing League courses from hostile forces, guarding them during matches as well. As the frames lack sentience and the powers of the Light, they are deployed in large numbers to overwhelm any enemies and are assisted by Guardians. Even so, casualties are massive: few frames ever return from their first battle, and fewer still manage to survive multiple engagements. Those that do return are linked together to share their combat data to improve their performance. This data is also saved for posterity and downloaded into new units. When a site has been cleared, Guardians make a final sweep and declare it ready for use. 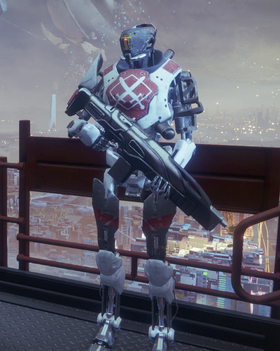 Arcite 99-40 (retired)- Former Crucible Quartermaster, assistant to Lord Shaxx and Tower weapons vendor.